Thanks for stopping by for Motivation Monday No 6! Is there a person in your life that you know who exudes kindness? A person you know who is always going out of their way to show others they care? I am lucky to have several people in my life who exhibit this trait each and every day. I was blessed to be raised by a mother who was the best example of kindness I know of. 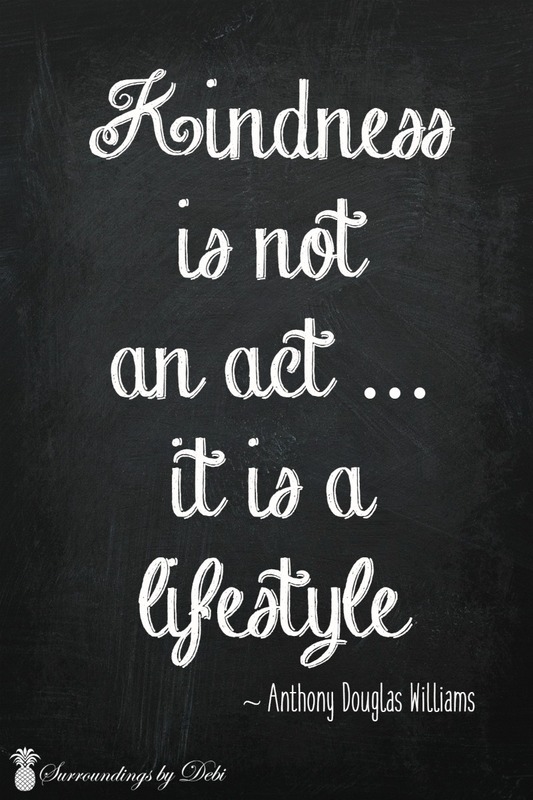 What comes to mind when you think of the word kindness? When I think of the special people in my life who exhibit this trait daily in their lives these words come to mind. Kindness is finding compassion and understanding for where another person is at. Respecting others and accepting others without expectations. Kindness is the quality of being friendly, generous and considerate. Kindness is often a spontaneous gesture of goodwill towards another and going out of your way to show them you care. Often when you see someone who looks upset or down a simple smile can demonstrate. Who do you think of when you hear the word Kindness? ……. Most importantly is there someone who thinks of you when they hear the word? In these trying times… the song from Tim McGraw comes to mind…simple words for his daughter going away to college “Always be humble and kind,” which pretty much covers everything for me. Thanks for the gentle reminder, Debi, have a wonderful week, Sandi.